Whether you’re considering starting up a side hustle or your training wheels are off and you have to build a DIY career quickly, your first big to-do item is the same: You need to get your first freelancing client. 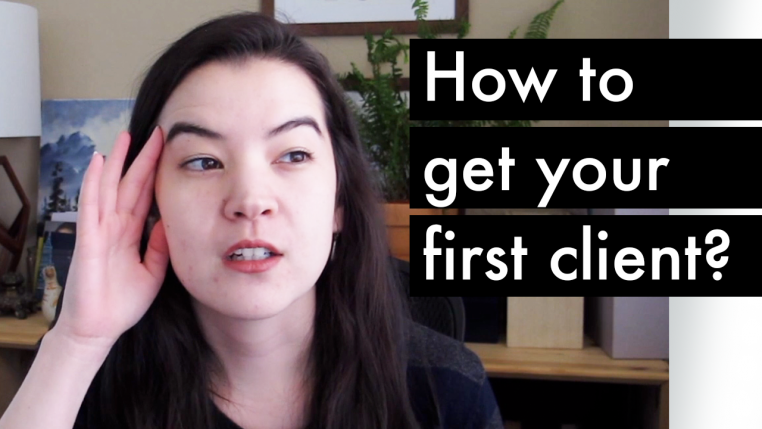 In this post, I’m outlining 8 ways you can get your first client. These techniques will look a little different for everyone based on how much of a freelance portfolio you’ve built. So if you have questions, as always, feel free to ask in the comments! Watch the video here. Or, if you prefer to read, I’ve got the juicy bits written out below! It’s a simple question, but there are a few layers I want to tease out for you. First, what do you WANT to do? (More on that in an earlier post) You might be good at something, but that doesn’t mean you want to do it as a freelancer. It’s better to take the time to start out on the right foot than to get 20 miles down the wrong path. This is an opportunity not only to change the way you work, but also the kind of work you do. And with that, remember: You don’t need to pretend to be an expert right out of the gate. If you’re inexperienced, just own it. It’s a million times better to say, “This is my skill level, and this is what I know I can do for you,” than to try to fake a bunch of competence you don’t actually have yet. Finally, when choosing what kind of freelance work you want to do, you might start thinking about niche-ing—finding that one audience or that one specialty you offer. That’s great for later down the line. But when you’re starting out, a niche can be more harmful than helpful. Start with a list of the things you can do and want to do, and you can narrow it down later. Who is your network? Simply your family and friends. Especially those who are involved in the business world. Chances are, the answer will be no. But when a need for your skills does arise? You’ll be at the top of their list to recommend. These websites are okay for building a portfolio. But don’t be fooled—you can’t build a sustainable career there. Get in, get some gigs, get out. Use it only to build your portfolio and get some testimonials. Of course, getting a gig in the first place can require some proof. Consider doing volunteer work to get your very first samples, or create some mock-ups to show your skills. Let me say it again: This is an okay starting ground, but don’t stay any longer than necessary. Cold outreach is when you contact a business who knows nothing about you. This is traditionally really sales-y, but again, it doesn’t have to be. Find the owner’s email or connect with them on LinkedIn. Send a short, friendly, to-the-point message about what you can offer them. Most freelancers without a portfolio will offer their services for free or at a discount and ask that, if the client likes their work, they’ll provide a testimonial. This is a great way to get some credibility. And as soon as you have that proof in hand, start raising your prices. Create posts at least once a week. In the post, teach something in your area of expertise. If you’re a designer, maybe you share a tip on how to use Canva. If you’re a copywriter, maybe you teach how to write a really good call to action. Add 1-3 relevant hashtags at the bottom of the post. Then, any time someone leaves a thoughtful comment in response, send a personalized connection request and strike up conversation (I learned this tip from copywriter Michal Eisikowitz, who’s killing it with her LinkedIn game!). In your conversation, you don’t have to be sales-y (are you sensing a theme? )—just ask questions to learn about them. Eventually, you can express your availability if they ever need your help. If you keep posting, you’ll be top of mind when that need arises. Go to meetups and events where potential customers could be attending—or people who interact with your potential customers. This could be a small business meetup listed on meetup.com, or a local chamber of commerce networking event. At the event, just be friendly! Ask folks about themselves. Make friends. Offer values. The goal isn’t to work the room—you’re here to build relationships. Find a few groups where your potential clients hang out—maybe no more than 5. Then, find out what its rules are. Facebook groups tend to fall into two categories: Those that allow self promotion, and those that don’t. Both are valuable in their own way. The ones that don’t allow self promotion essentially act as a bulletin board. So you can offer your services, then see what comes back. It’s worth a shot. You also want to add your specialty to your Facebook bio—that little space that shows in the top left corner of your profile. Throw your website URL in there as well. When someone in the group needs help with something you offer, you’ll come to mind. Or even better, the other members will remember you and recommend you! Many agencies are on the lookout for specialists they can subcontract some of their client work to. This allows them to stay flexible, instead of hiring and firing people every time they get or lose a client. There’s no single way to start working with agencies. For one idea, you could begin asking around your local freelancer community to find out which agencies work with freelancers. It’s possible to ask for an intro if your relationship with them is strong enough (and if your pitch wouldn’t be stealing their work from them). Or, you can send a cold email. Search for the company on LinkedIn, then go to the employees section. This will give you an idea of how the company is structured so you can find who would theoretically be in charge of hiring people like you. Then, it’s just a matter of tracking down their email. Sometimes it’s listed on the company website, or on the LinkedIn account. If you can find another employee’s company email, you can also use that structure to guess what your target’s email is—they likely follow the same format. Then, send a short, complimentary, heavily personalized email that suggests how you might be able to help them. Rinse and repeat—cold emailing is always a numbers game. Every now and then, you’ll come across a freelancer who’s go their stuff figured out. And guess what? They’re probably turning away more work than you realize, or at least outsourcing it. I hope this has been valuable!